I knew Yamaha FG700S Acoustic Guitar from an old friend of mine at my high school reunion last year, when he had just started learning guitar. By performing a fascinating song with the guitar, he amazed me and everybody in the room. To be frank, I have to admit that seemed so cool and I wish I could be able to play the guitar as well as he did and admired by other people. After the meeting, I asked him a lot about guitar and how to master guitar techniques in a short time. The first sentence he say is “Firstly, you have to get a good guitar”. Having no experience at selecting guitars, I immediately thought about his guitar, Yamaha FG700S Acoustic Guitar as I knew later, which is also the guitar he highly recommend me to begin practicing with. Therefore, a few day later, I searched on Amazon and ordered a Yamaha FG700S Acoustic Guitar similar to his, during that time I learned that the guitar is also a bestseller on Amazon. The guitar came in a good state exactly as expected. Overall, I believe I have made a wonderful decision that I will never regret. The guitar is charged at a pretty low price for a veteran’s guitar, so I think it is more like an entry-level guitar. However, my friend told me that the guitar had an interesting features compared to other guitars for beginners, which is the solid wood on the top (also known as the soundboard). After some research, I learnt that the wood used to create the soundboard, which is sitka spruce to be more specific, is also a quite reliable wood material. That means the top is on par with that of a deluxe guitar in term of quality. Usually a guitar whose top made from solid instead of laminated wood easily costs more than $500 since solid wood offers better durability and tone quality. Unlike laminated wood, solid wood can even improve in quality over time. I believe other components of the guitar is also made from great materials, such as nato back, rosewood fretboard. Also, die-cast tuner is a nice item included in the kit. That is the reason why some people may argue it is better than just an entry-level guitar. Honestly, I don’t know what professionals may say, but in my opinion the guitar can perform well if you have decent skills. 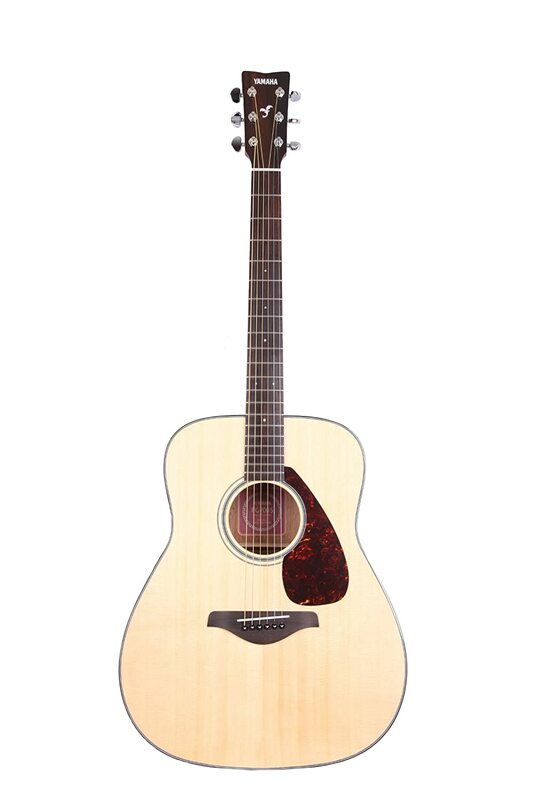 In short, if you are a beginner or even a casual player, Yamaha FG700S Acoustic Guitar may be what you need. The guitar has a great value with a relatively inexpensive price. You may have understood that the guitar has several advantages and is generally a good guitar from the previous section. However, I still think it is necessary to provide you more information about what the guitar is good at. First and foremost, the tone quality has strongly impressed me. The guitar is pretty loud that you can play it in a corner of a 100-square-meter (1075 square feet) room and the people at the other corners of the room can still hear clearly. The sound of the guitar is also rich and mellow, which I think is due to high-quality materials as explained above. Secondly, the guitar is light and easy to hold. I feel pretty comfortable holding the guitar while playing. Thirdly, the action (or the space behind the strings and in front of the fretboard) is proper so you will feel convenient when pressing the strings. Actually, this is what my friend said instead of my own opinion because I haven’t even play many other guitars yet to know how improper action feels like. Fourthly, the guitar is so well-made that I didn’t find any technical error. In fact, it was intact when delivered to me; and after several months of use, the guitar is still performing very well. Last but not least, the price makes it a huge buy for me. From my perspective, the guitar hold a much greater value than its price. While the price is just at entry-level, I feel satisfy about almost everything of the guitar. About this guitar, I have actually very few things to complain. The only thing I think worth mentioning is that my strings was broken recently, which I don’t even know whether or not it is a technical glitch because I haven’t yet master my techniques as well as maintenance skill. After string replacement, the guitar continued to perform well as usual. To summarize, this is a very well-made product by the famous brand Yamaha. From now on, if there is anyone who is new to guitar but wants to play and asks for my advice, I will certainly suggest him/her to start with Yamaha FG700S Acoustic Guitar.